This is a new item I listed on Webstore the other day. 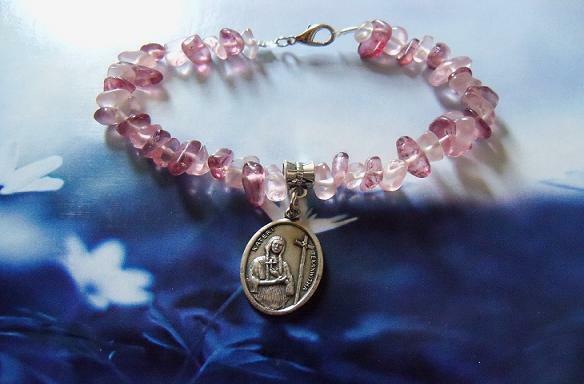 Light and dark purple glass beads were used to make the bracelet along with a Saint Kateri Tekakwith medal. This entry was posted in Crafts, Native American, Online Store, Shopping and tagged Crafts, Jewelry, Native American, Online Store, Saint Kateri Tekakwitha, Shopping, Tsalagi Dreams. Bookmark the permalink. Thank you. I have been making crafts since 2012, I believe, and I think they have improved too. I have a question for you. Do you have good luck selling your jewelry online? What sights do you use? I don’t sell items all the time, but I have sold some. I hope to eventually have my items selling more regular, which is why I post them on here and on Twitter to try to promote them. I sell my items on Webstore.com. They charge no fees whatsoever and that’s why I use them so I can keep my prices more reasonable. The only fee I get charged is from Paypal. I saw it and had to buy it. It will make a great gift. I will get the bracelet ready to ship and I will mail it on Monday. I actually have three Dreamcatchers with Saint Kateri Tekakwitha medals. They are all listed on Webstore. Thanks for buying again. Both items will be mailed on Monday. I got them both yesterday along with your Thank You note. You’re very kind. Have a great evening! Thanks for letting me know you got them.